We're more than spoiled by the sheer amount of so-called 'boutique' pedals that seem to be coming out of the walls at the moment, and it's a revelation when we find one that has real potential to be included on numerous pedalboards in the months to come. It offers great tones and open-ended versatility. Not as dirty as some may require. Comet Effects are a new company featuring a number of custom-made stompboxes built by Shane Brooks from his base in Devon, UK. 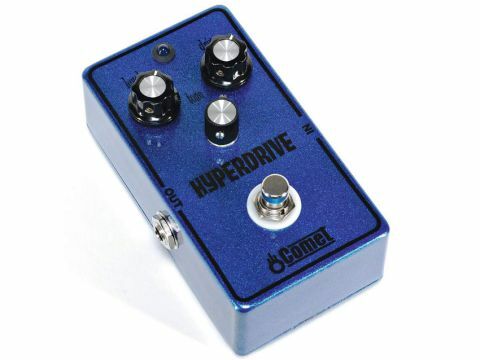 The Comet Hyperdrive is a darkly good-looking overdrive number. It's quite a chunky unit and subtlety swathed in a metallic blue and black paint job, offset by a supernova-bright blue operational LED. The trio of controls comprise level, tone and drive and there's an input of an optional PSU if removing the base plate to access the battery becomes too much of a chore. As with the Ibanez Tube Screamer, we find it a pleasant surprise that, with the drive control set to minimum, the tone of our initially clean amp was slightly warmed up: much better than simply removing the signal entirely. Even at its maximum setting the Hyperdrive is restrained and offers a fat overdrive not a million miles away from that of Billy Gibbons in its greasiness. In front of an already singing amp, the pedal comes into its own and is even more articulate than the TS9. It adds girth and heat to your tone and responds well to guitar-volume manipulation too.